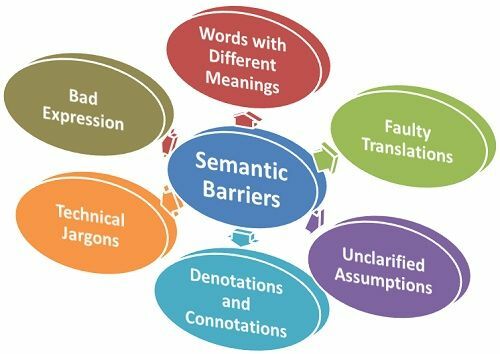 Definition: The Semantic Barriers refers to the misunderstanding between the sender and receiver arising due to the different meanings of words, and other symbols used in the communication. Bad Expression: The message is not formulated properly and the language used is so difficult that it could be misinterpreted by the recipient. The message is said to be badly expressed if the wrong words are chosen, the sentences are not sequenced properly, and there is a frequent repetition of words or sentences. The badly expressed messages consume a lot of time as it requires corrections and clarifications and also the impact of the message gets reduced. The bird sanctuary is full of cranes. The builder used a crane to lift heavy steel rods. The girl has to crane her neck to watch the movie. Faulty Translation: Sometimes, the sender translates the message as per his level of understanding irrespective of the recipient’s comprehension level. For example, a manager collected information from his superiors and subordinates and translated the same information to all his employees, according to the understanding level of the superiors, and this led to the misinterpretation of the message. Thus, it is required to mold the message according to the understanding levels of the employees to have an intended response. Unclarified Assumptions: Sometimes the sender creates assumptions about certain things which he feels the receiver must be knowing about it and focus only on the subject matter. But in the case of a special message, if the assumptions are vague and unknown to the receiver then the communication might get adversely affected. Denotations and Connotations: The denotation means the literal meaning of the word, it just shows the name of the object and does not imply any negative or positive qualities. The detonation barriers arise due to the sender and receiver using a different definition and meaning of the word used in the message. Such as word crane is used in the context of bird species but it is interpreted as a vehicle that lifts the objects. Whereas the implied meaning of the word is called connotation that arouses personal reactions and qualitative judgments. The connotation barriers arise when the people use words that hold different meanings in different abstract situations, contexts, feelings, etc. For example, the word beautiful and confidence has a positive connotation, but can have any of the meaning depending on the context in which it is used. Technical jargons: Often people working in the technical groups such as engineers, production managers, IT managers, etc. use the technical jargons in their communication which is quite difficult for the layman to understand. Thus, the use of technical jargons in communication can act as a barrier. Thus, semantic barriers lead to misunderstanding of the information and the objective of communication, i.e. for which it was intended, gets disrupted.